Holocaust books are very much in abundance these days more than ever. Due to the intense subject matter, its hard NOT to be moved by the author's story in most cases. 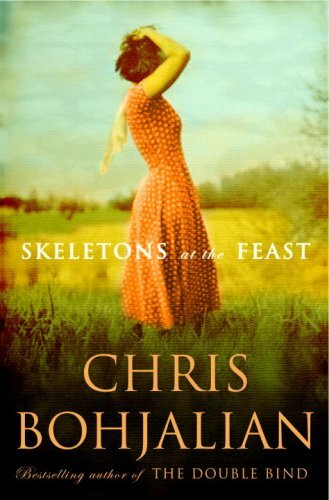 Skeletons at the Feast by Chris Bohjalian should be moved to the top of your reading list versus any other recent and popular Holocaust books; such as The Guernsey Literary and Potato Peel Pie Society by Mary Ann Shaffer and Annie Barrows or The Book Thief by Markus Zusak. I want to warn you though - Skeletons at the Feast is NOT for the faint of heart. Bohjalian pretty much incorporates explicit violence within the first 2-3 pages of the novel which may be his way of preparing readers for the events ahead. Skeletons at the Feast centers around a few key characters and their lives throughout the course of two years during the Holocaust. Anna is a young German refugee woman who travels with her family west to cross British lines and is accompanied by Scottish POW Callum, her lover. The family and Scotsman meet up with Manfred, a soldier impersonating a German captain but is really an escaped Jewish man named Uri. Together they face the trials and tribulations of traveling on foot to safer ground. In addition to these characters is Cecile, a woman who tells us her story from behind the fence at a concentration camp. This book is told from the viewpoints of all these characters, giving us a well-rounded feel about this particular time period. The violence is indeed disturbing and very explicit, but because of how well the book is written, it can be overlooked enough to keep reading. Uri is my favorite character because he is the heroic rogue Jew exacting revenge on the German soldiers. You'll find yourself cheering when its time for Uri's story in the chapter. Unfortunately, this book may bring you to tears in the end if you find yourself devouring this wonderful book. Definitely make sure a box of tissues is at hand, and settle down to read Skeletons at the Feast .